Medical Acupuncture is based on Traditional Chinese Medicine principles, that has been developed, researched and refined for over 2,500 years. Traditional Chinese Medicine acupuncture philosophy believes that illness and pain occur when the body's qi, or vital energy, cannot flow freely. There can be many reasons for an imbalance of qi; physical, chemical and or emotional stress, poor nutrition, or infection are among the most common. By inserting ultra-fine sterile needles into specific acupuncture points, a medical acupuncturist seeks to re-establish the free flow of qi to restore balance and trigger the body's natural healing response. There has been much clinical research which shows that medical acupuncture safely treats a wide range of common health problems. Medical acupuncture is used for certain conditions has been endorsed by the National Health Service of the United Kingdom, the United States National Institutes of Health, the World Health Organization, and the National Centre for Complementary and Alternative Medicine. Dry needling is a modern treatment that has been adopted from traditional acupuncture and medical acupuncture in the last couple of decades and is growing in popularity. This method is designed to mainly focus on muscular pain and stimulate trigger points. During a dry needling treatment, our experienced medical acupuncturist at our Bedfordshire clinic near Kempston will insert several filiform needles into your skin. These types of needles are fine, short and stainless steel - they don’t inject fluid into the body, hence the term “dry”. The needles will be placed in “trigger points” in areas of knotted or hard muscle and tissue, which is sometimes referred to as intramuscular stimulation. Dry needling is said to help release the knot and relieve any muscle pain or spasms. The needles will remain in your skin for a short period of time but the length of time will depend on what your medical acupuncturist thinks is best. All our medical acupuncturists at AMI clinic are fully qualified and experienced in medical acupuncture and dry needling. 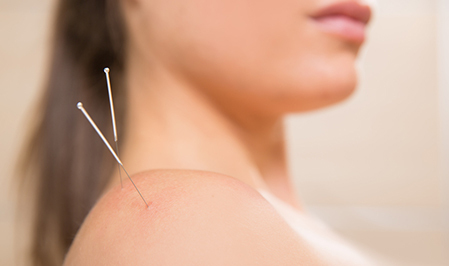 If you are suffering or are interested in how medical acupuncture and or dry needling can help you, then call and make an appointment today with our acupuncturist and visit the AMI Clinic near Kempston in Bedford, Bedfordshire.